Smart Grid is reaching a rough patch on the road to the promised land of our clean energy future. Oh we’re installing smart meters everywhere, but that is the easy part. And besides many of those smart meters were paid for with stimulus money that is, pardon the pun, unsustainable. But now that we have all those smart meters installed what are we going to do with them? That’s where beer comes in! It is going to take a lot of beer and discussion to get agreement on the standards for living into all that smart grid hype. FERC recently denied a request from the National Institute of Standards and Technology (NIST) to adopt an initial set of standards for smart grid saying it did not believe there was yet a sufficient consensus across the industry. Market Wars to be the Blu-Ray of Smart Grid. As utilities started installing smart meters technology vendors rushed into the market each with their own proprietary software, gadgets and hardware hoping that being an early mover would position them to become the big dog in the race. It didn’t work out that way. A good technology product is nice but not sufficient when you must combine it with a bunch of other good products to actually make the promise of smart grid work. See what I mean? Since all these products were designed to be unique so that their owners could be zillionaires if they sold more product than competitors—few work well together. Along comes NIST to get the players to start acting like a team to play in the smart grid big leagues, but the problem is, as the old joke goes, unless you are the lead dog the view is always the same. So we are in the consolidation stage of market warfare to determine lead dog. ‘Is that All There Is’ Problem. The hype over smart grid has raised expectations about what life will be like in our clean energy future. The problem is now that Uncle Sam is no longer stimulating it all this smart grid stuff not only must work it must be cost effective. Oh Oh, big problem number 2. A lot of this stuff requires more investment to retrofit the last century transmission grid we built before we get to the promised land of distributed energy, microgrids and renewable energy on every corner. So a lot of those smart meters are looking pretty dumb in this in between time before the smart is built into the grid. Customers naturally resist rate increases for much of this required investment because they think that ongoing capital repair and replacement is work the utility should already be doing. Smart grid is becoming a tougher sell to customers who see little benefit from making the utility more efficient if their rates must go up to do so—is that all there is? The third rail of the smart grid future—dynamic pricing. Regulatory economists can talk until they are blue in the face about marginal costs and price elasticity. For the 99% customers of utilities the last thing we want to hear is about rate changes that are ‘dynamic’. It sounds painful. In cases where customers actually have real-time pricing or peak day pricing as it is called here in California they can sometimes save a little money by turning their thermostat up a few degrees or down a few degrees. But re-training customers after more than a century of average cost pricing is not quick and easy. Ask the people in Bakersfield, California stung by the coincidence of high summer temperatures, a steeply progressive tiered rate design and smart meter installation who showed up at a feel-good public relations event waving their sky high utility bills and demanding answers from PG&E and the politicians in attendance. YIKES! The electric power system in the US and EU is fragmented and no segment has a financial incentive to take responsibility for putting all the pieces of the smart puzzle together in order to get the benefits of smart grid for customers. Distribution utilities have mixed incentives to invest in smart grid. Utilities can save labor costs by reducing manual meter reading, but they buy energy in the wholesale market under long term contracts or in the spot market. And unless their tariff rates are decoupled the utility earns more by selling us more energy—why would they want us to use less? In states where rates are decoupled from consumption, the utility gets paid to deliver energy for a fixed customer service charge and its earnings otherwise are based upon meeting its agreed performance targets which might include energy efficiency so it wants us to use less to get its earnings reward. That is why you see gimmicks like programmable thermostats, sealing ducts from leakage, weather stripping and CFL light bulb programs. Renewable producers like wind and solar developers rely upon the regional transmission grid to provide the transmission access. They have no incentive to build new transmission or the deep pockets to do so. And besides, the onerous regulatory burdens of environmental permitting for transmission lines are cost prohibitive for most clean energy firms. USDOE is charged with studying transmission congestion but was beaten in court when it proposed national interest electric transmission planning corridors. So it is just going through the motions until Congress fixes the law to clarify its authority to address transmission access and congestion issues. FERC would take the transmission challenge but States don’t want the Federal Government usurping their state authority. 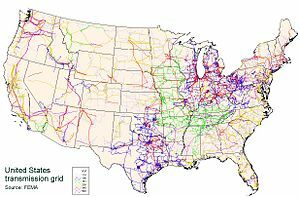 So FERC can “confer” with the states but lacks the clear authority to authorize the interstate transmission construction necessary to scale the smart grid enough to be profitable for vendors, technology producers and customer aggregators. Big players are moonwalking from smart grid. Some of the most ambitious players in the emerging smart grid market like Microsoft, Google, and Cisco has cooled to the venture because they cannot see a scalable market that makes it profitable for their software and technology products given the fragmentation in the energy vertical. Others see opportunities to extend current products into niche markets so we see firms like EnerNOC, Comverge and CPower working with commercial and industrial energy buyers to improve efficiency and reduce their overall energy costs but this is just good business and has little to do with smart grid. A recent survey done by Silver Springs Networks, the smart meter installer, found that consumers expect better information, more choice and more control as benefits from the smart grid. But only 39 percent of those with a smart meter for more than 6 months check their energy use more than once a month. The survey found that 70 percent of customers with smart-meters say they want to receive energy advice and 67 percent trust their utility as the best source of that advice. While 56 percent of customers surveyed said they expect their smart meter to help them save money, but fewer than 8 percent of customers actually do anything with the information available from their smart meter. Let’s face it this is not a ringing endorsement of the benefits of smart grid technology and certainly not a good ROI for the billions spent installing smart meters. The Smart Grid Reality is benefits are more likely from distribution automation and integration of distributed energy resources not from customer actions. So control technologies that improve performance and reduce operating costs across the utility distribution system ought to be high near term priorities. The biggest benefit longer term will likely come from utility strategies to shift the energy business model away from large central station power generation to favor more distributed energy resource options in collaboration with customers like microgrids, combined heat and power, rooftop solar and customer aggregation for demand response, energy efficiency, and monitored energy management services. These small scale resources located closer to the load centers reduce the need for larger scale remote generation, reduce the cost of transmission and mitigate the regulatory delays and litigation risk from large scale projects. This will improve the distributed resource networking potential of utilities while adding the benefits of customer owned generation and more customer engagement may be the best balancing of interests and best use of the smart grid technologies. So what does all of this have to do with beer? The growth in sales and consumption of beer has been slow, much like electricity sales. The result is pressure by investors to improve earnings by cutting costs and growing market share. That adds pressure to reduce fragmentation in beer production through consolidation and so our favorite brands are getting married creating fewer bigger companies using economies of scale to drive down the cost of producing beer. But even as beer companies got bigger and bigger on a global scale, a funny thing has happened. Small craft beer producers proliferated in a competitive market where variety and quality allowed many to carve out profitable niches. Seeing craft beer popularity rise, the bigger brewers acquired craft brands or created their own to give customers what they want. Some of these same competitive pressures are at work in the electric power business today. Traditional regional electric utilities face competitive pressure to get bigger, improve earnings growth and spread their high capital costs across more customers. Few utilities are good at the complex technologies of smart grid and fewer still are any good at customer engagement. meanwhile, regulatory requirements force utilities to diversify their sources of supply adding cleaner, greener renewable energy to their portfolios even at above market costs to reach predetermined targets. Utilities also have tried with varying success to diversify their market presence to avoid having all their eggs in one regional market, diversify fuels and take other actions for growth. Consolidation has always been tougher for utilities because of the state by state regulatory framework. Conditions for approval of utility mergers often come with strings that claw back much of the benefits of the consolidation such as divestiture of power generation to unregulated entities. But these were strategies of choice from previous boom and bust cycles. Fragmented power markets are anathema to smart grid success. Why? Technology vendors need scale to drive down the cost of their technologies and gain the critical mass to make products like demand response profitable. Look at what happened when China began mass producing solar PV panels and wind turbines—prices fell dramatically. In the smart grid utilities need interoperability from common standards to drive down technology costs. Vendors need the ability to aggregate customers to gain the market scale necessary for demand response and energy efficiency to be profitable. Both utilities and technology vendors need the East-West transmission access denied today because of the traditional structure of the power grids that make it much easier to move power north and south. We need to be able to get West Texas and Iowa wind resources to southeast US markets that lack them. We need to get Arizona solar resources west to California markets and north and east to Midwest markets to continue to drive down the costs of wind and solar renewable energy resources to grid parity. And then there is this, the expansive growth of natural gas E&P from unconventional sources is creating a profound opportunity to shift America’s energy mix away from coal in order to reduce greenhouse gas emissions by substituting natural gas fired generation. But even these low risk substitution options require transmission to bring the energy to the markets that require it. If we don’t build new transmission and enable scalable markets for renewables and distributed resource we’re going to end up with a lot of Bud and Miller Lite and a lot less Sam Adams, Anchor Steam and a score of other high quality craft brews in our energy menu to offer choice at the party or neighborhood hangout. For decades on the electric power side base-load power from coal and nuclear formed the bedrock of the portfolio. Natural gas was the mid-merit fuel facilitating the need to follow load up and down each day or each season and at the top of the portfolio mix was peaking power that was cheap to build but expensive to run except when you needed it most. Today we have more options but they require subsidies to get to scale and drive down their cost to grid parity (prices competitive with natural gas). But when the subsidies run out (and they will) all of these options must compete for a place at the bar on their own merits at competitive prices. To realize the promise of smart grid we need more than just smart meters. We need an electric transmission system capable of handling thousands of small distributed wind and solar projects. We need a system that is ‘smart enough’ to detect imbalances in the system and ‘self heals’ by finding a designated driver (probably natural gas again) to follow the load and fill in the gaps in the intermittent power options. Producing more domestic natural gas from unconventional sources here at home is a more efficient market equivalent than a thousand new regulations in trying to clean up coal. Abundant, affordable natural gas will shift the portfolio faster, make possible accommodating more wind and solar—and reduce emissions at a lower cost to consumers than trusting government bureaucrats to do the job with energy industrial policy and environmental regulations that strangle innovation and slow down economic recovery and growth. The market logic of craft brews is that it fills a niche customers want in choice, diversity and quality so that the big dogs of the beer business don’t take the ‘cheap to produce and more profitable to sell’ route of just giving us Bud and Miller Lite. But that choice requires distribution to get the craft beer to market. And so does the smart grid-enabled power system. So if we want choice, diversity and quality in our power mix we need distribution—transmission—to bring it to market. Otherwise putting a smart meter on the beer tap may be interesting but it sure won’t be worth it if all it does is raise the price of Bud. There ends the rant—I’m thirsty. Next Are We Rushing the Smart Grid? Pingback: Mergers and Market Competition Separate Energy Princes from Regulatory Frogs « Zap! Crackle! Pop!